Tony Perry says reading reactions to his Nov. 25 retirement from the Los Angeles Times was like a scene from Mark Twain’s “The Adventures of Tom Sawyer” — when Tom and Huck Finn hear sermons at their own funeral. In fact, what Perry meant to readers was foremost in the minds of his fans and former colleagues. Times of San Diego sought some reactions to his career and taking the Times buyout at age 68. I do wish I could have hired Tony. He’s a terrific reporter and a really good writer. He would have been a great addition to our staff. Tony had an amazing ability to take the most complex San Diego story, often one that was years old, and explain it clearly in surprisingly few words. His eloquence, knowledge and perspective will be missed. No question Tony’s institutional memory will be missed. He brought a unique perspective to San Diego news coverage: He was an insider’s outsider. He knew the players and the history of San Diego but wrote about it from a wider perspective. When combined with reporting from other outlets, this made for really informed coverage of local politics, the military and other issues for people here and elsewhere. I wasn’t surprised he took a buyout. Nothing in journalism surprises me anymore. But I was a bit melancholy because of the insight, humor and big-picture commentary he brought to his writing and radio appearances. I and San Diego are grateful for his years of service. Tony is a professional journalist of the first order – an outstanding reporter, a clear, cogent and concise writer, with unending curiosity about an incredible range of subjects. Of course, he covered breaking news while also searching out smart enterprise stories. But he also wrote for Sports, Calendar, the Book Review, National and Foreign – sometimes all in a given month. He has unrivaled knowledge of San Diego, which was always useful to us. And powerful people returned his phone calls. 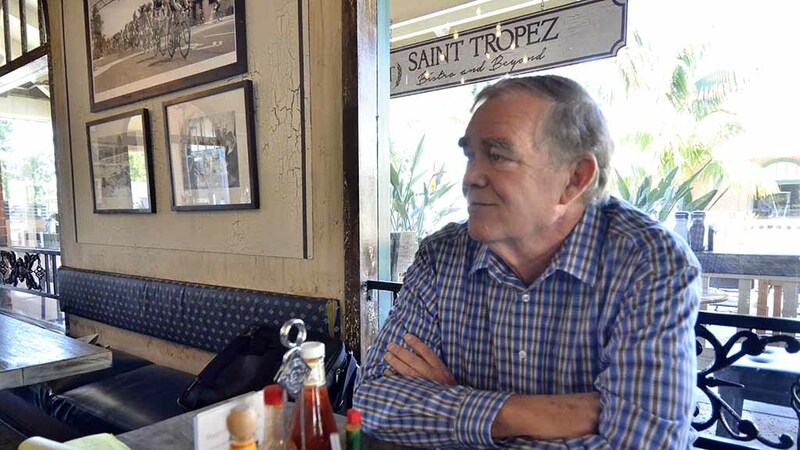 Losing Tony Perry to retirement is a loss, not just for the L.A. Times, but for all of San Diego. He had decades-worth of tales and scandals stored up in his reservoir of institutional knowledge. And each of his stories were sprinkled with those contextual gems that really made us better understand and appreciate this great region. He was an old-school scribe, grouchy and impatient with sources at times, but his bark was worse than his bite. And he really shined as a journalist interviewing the families of fallen Marines. I was privileged to witness this when he asked me to go along to an interview of a Spanish-speaking family whose loved one had died. Tony walked around the home as if it were a shrine, speaking in a hushed voice. And though he had done thousands of similar interviews, he treated the relatives with a tenderness and sensitivity that was really inspiring. One of Tony’s most memorable stories was about Memorial Day preparations in 2011 at Fort Rosecrans National Cemetary. Editors ordered it up at the last minute and he produced such a touching story that it brought tears to readers’ eyes. Check it out here. We all marveled at how a man of his age volunteered time and time again to go to Iraq and Afghanistan. It wasn’t easy on him getting shuttled back and forth on transport planes and helicopters, sleeping on cots for days on end. He’d return exhausted. But he was always willing to go again. His reporting was always fascinating, focused on the compelling details of everyday life for the ordinary Marine. One of the things I’ve always admired about Tony is his versatility. There’s no story he can’t write, and write well. I have a number of relatives and friends who live in parts of Southern California outside San Diego County. I have gotten used to the fact that when we get together, they will talk about something that’s happened recently in San Diego, and they will know about it from having read one of Tony’s stories–and when I say know it, I mean they will have read deeply into the story, not just the first couple of paragraphs. That speaks to his ability to engage readers for the long haul, not an easy thing, especially these days. Along those same lines, I think people who subscribed to the Times during Tony’s tenure got an accurate picture of San Diego because of his talent and experience and knowledge of the community — not boosterish and not sensationalistic. Sometimes bureau chiefs stationed away from the Mother Ship can go after stories that get them noticed, or write them in a way that draws a snicker back home, but over time those reports can skew a reader’s understanding of a place. I never felt that way about Tony’s reporting. My reaction to his buyout was this: Good for him. He reached the finish line in full stride, still doing his thing. Before the Times bought the Union-Tribune, it would have been tough for them to replace Tony’s kind of expertise and institutional knowledge. That said, he has decades of experience and knowledge of San Diego issues, stories, power broker and characters and that is very difficult to replace. There are few left at the U-T with his years of experience since they offered buyouts to so many lately. That’s a problem for newspapers across the country as experienced and highly knowledgable reporters leave due to shrinking staffs throughout the industry. Tony is very smart, an excellent reporter and most importantly a fine writer. It’s been my experience that top writers are top thinkers and Tony certainly is evidence of that. He had a unique role here for many years as “Bureau Chief” in a bureau of one, giving his work and influence a special place within the LA Times. I’m not surprised he took the buyout, since he’s of retirement age and it’s a good deal by newspaper standards. But readers are losing an important voice on all San Diego-related issues. I have been working with Tony Perry for more than a decade. I was surprised to hear that he was leaving the Los Angeles Times and feel that we have lost someone who really worked to understand and get a story right. The stories about conservation and animal care are not always easy to understand, but Tony has worked over the years to learn about what we do and the intricacies of the science. I think he has been a tremendous help in getting out the word about what is happening with species all over the world. Tony is very news-focused. Many of the reporters we work with are interested in cute baby stories, but Tony has always looked for something with more “meat” to it. Because of his longstanding relationship with the Zoo, and the fact we knew he would behave appropriately in the situation, with one of the panda youngsters we offered him an opportunity to see the baby panda up close (not something we offer to everyone). Tony actually declined until he was assured his editor was interested and he could bring in a photographer as well. I fondly remember him calling me on one of his tight deadlines one afternoon while I was in a car with a photographer, frantically chasing down an officer-involved shooting story. Tony was looking for a pithy quote about Bob Filner, and cut me a few minutes’ slack to come up with something I wouldn’t mind seeing in print. It didn’t take long, and I don’t recall what I said, but it served both our purposes in a hurry – and he was always available for on-camera perspective for my stories and as a guest on “Politically Speaking” segments. Tony’s institutional knowledge is such that whoever winds up assigned to what he covered would be advised to reach out to him with great frequency. He knows the woof and warp of this community’s political, business and sociological structures, so his work had deep depths of insight. I agree with Tony’s citing of his [1st Marine Division] embed work; it was remarkable combat-theater reportage, filled with keen observations of the Marines’ courage and what was going on their hearts and minds. But let’s not discount his long-term service of sizing up San Diego with wit and wisdom as an observer whose conclusions you could take to the bank. I accepted the inevitability that he saw [the buyout] in his best interest, all things considered. I’m having a hard time accepting the reality of not seeing his byline and what he could deliver under it, going forward.